More than a cookbook, this guide also encourages a renaissance of “wild agriculture,” one that foregrounds the ethical harvesting and selection of wild foods and the re-planting of native food sources in urban and residential areas without imported water or fertilizers. It contains stories of significant individuals, organizations, and businesses that have contributed knowledge, products, and innovation in the planting, harvesting, and use of wild, native desert foods. Additional essays reveal the poetry of the foraging life, how to plant the rain, and medicinal uses and ethnobotanical histories of desert plants. Many of the food plants included in this cookbook—or close relatives of them—can be found or grown in the other deserts and drylands of North America and South America. As such, this book becomes a template for harvesting and cooking throughout the Americas. Universally, its concepts and approach can help communities everywhere collaborate with their ecosystem, while enhancing the health of all. "After reading this recipe compilation, no one can say that a desert stands for 'nothing to eat.' For many centuries, indigenous peoples of the Sonoran Desert, that arid land surrounding the Gulf of California and stretching out of Mexico into Arizona, sustained themselves by foraging from the abundance of wild foods around them, such as pods from the mesquite tree and leaves from the prickly pear cactus. Barbecuers know mesquite from the excellent smoke its wood produces for outdoor grills. But for desert dwellers, the leguminous pods make nutritious, sweet, and gluten-free flour for breads and pancakes. Other cacti and other herbs offer still more culinary adventure, and these recipes exploit such wonders. A section on solar cooking reinforces this cuisine’s ecological benefits. 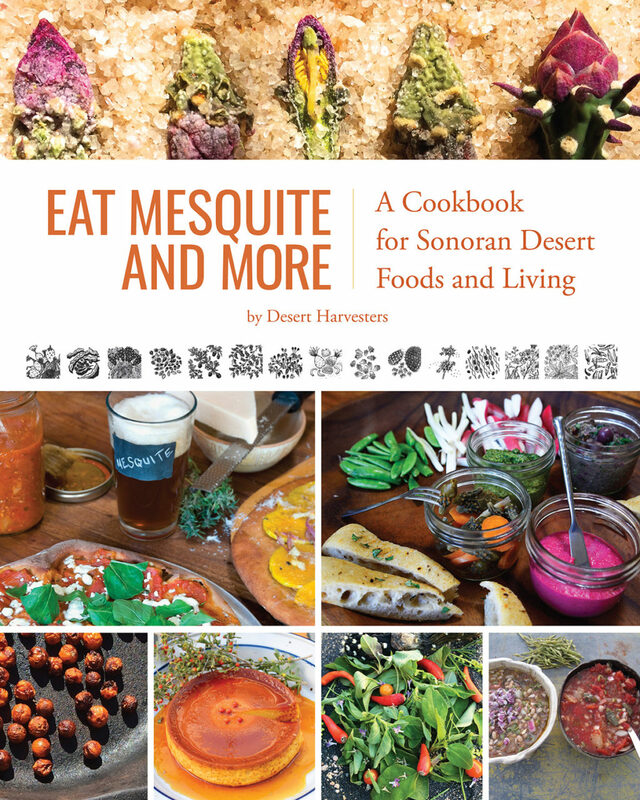 The current craze for foods from foraged sources makes this book even more significant, but residents of the American Southwest with immediate access to desert bounty will derive the greatest value." Desert Harvesters is a grassroots organization born of a desire, and evolved by a multi-decade practice, to grow, connect with, and contribute to a more delicious life enhancing our health and that of the place where we live, work, and play. We promote and enhance the planting, awareness, and use of native wild food sources, which can thrive on harvested rainfall and runoff without the additional irrigation that depletes both groundwater and creeks and rivers. We offer workshops in how to harvest and prepare mesquite and other native foods, hold community events to celebrate local harvests, run tastings and mesquite millings to improve the harvest and simplify its processing, and plant native food-bearing trees and understory plantings throughout Tucson and beyond. By fostering a reciprocal relationship between native plants and local people, we believe (and have found) we can strengthen local food security, reconnect people with the ecosystem, and build a more dynamic and sustainable community.